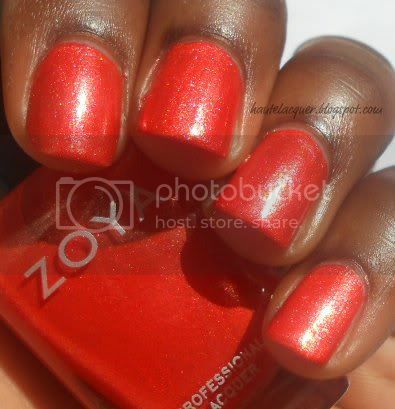 Zoya Beach & Surf Collections Swatches and Review! 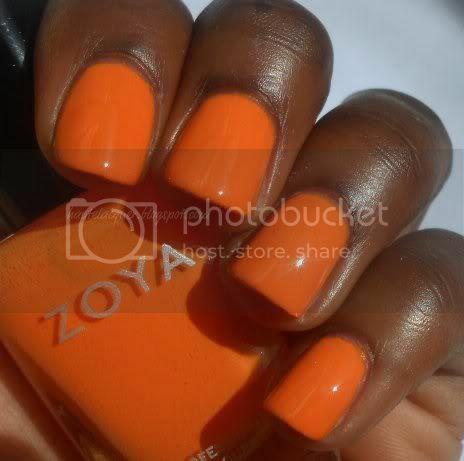 As you can see by the title, today I'm showing you the Beach and Surf Summer Collections from Zoya! I'm usually never excited about Summer collections but these two collections really got me excited. I honestly couldn't wait to swatch them! These pictures were all taken in natural lighting with two coats of each polish unless stated otherwise. Reagan. This is a deep pink cream with strong purple undertones. Great formula, I had no issues with application. I know it looks very purple here, but trust me, it is pink. This is not a unique color by any means but it's great for pink lovers. Lara. This one is unique in the way that it looks hot pink in some lighting, but more of a medium pink in others. Here it's leaning more towards medium pink. It does have a slight berry undertone. Shelby is the perfect bubblegum pink. 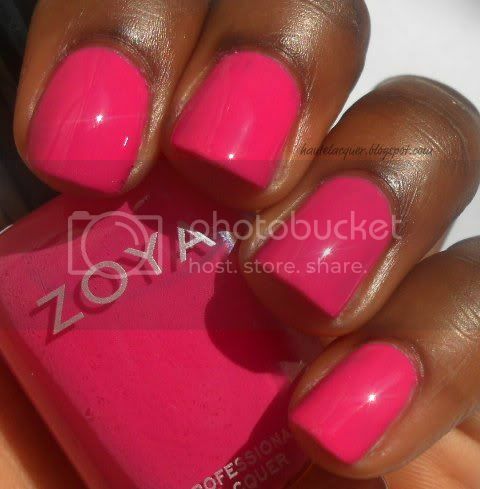 This polish is so Nicki Minaj to me; she's always rocking bubblegum lips. And look how shiny! I had some trouble with application, as this took 3 coats. With two coats it left it looking "patchy." Arizona is a light tangerine orange with yellow undertones. This color is so yummy I could eat it! It's already on my toes. I don't have anything like it in my collection. It's not a regular orange (like the fruit), it's more towards the color of orange juice. And y'all can't tell me you don't love the name of this beauty. 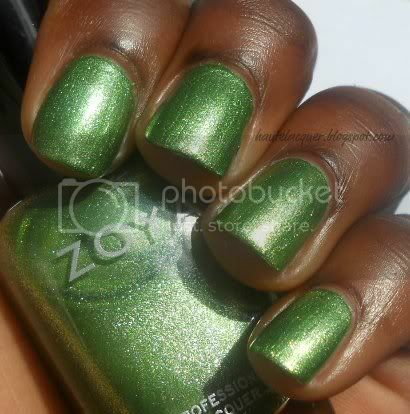 Zoya Tracie is a light mossy green with a silver frost finish. The frost is pretty subtle in real life so if you don't like frosty finishes, but you like this color, it's still worth buying. It's definitely the best formula I've ever had with a frost. Wednesday. A muted turquoise blue. This one is gorgeous! Wednesday, to me, could also be a spring color. It's not a pastel but could certainly be worn as a spring or summer color. Two in one, oh yeah. Rory. This is a light pink metallic packed with silver, shimmer particles. At some angles, I even see a little bit of copper shimmer. This dries semi-matte so I recommend a topcoat. Not my favorite color of the collection but it is pretty unique. 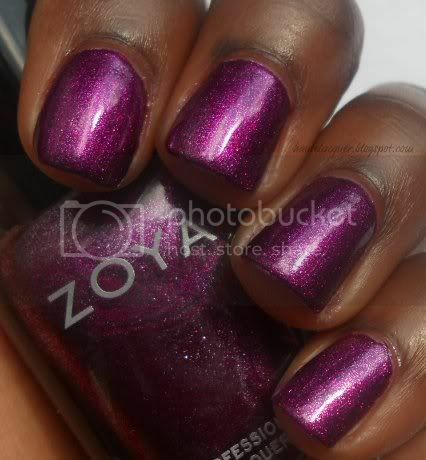 Carly is a beautiful, deep purple with a fuchsia flash and packed with silver shimmer. For some reason, the silver is not visible in this picture but you can see it in the bottle. Carly seems really out of place in this collection, reminds me a lot of a winter or fall polish. Kimber. This looks super red but it's more of a bright raspberry pink with copper and silver shimmer particles. Kimber is another name I adore. This had flawless application, just like the majority of the two collections. Myrta is a bright coral, orange metallic foil. This is so citrus-y. This type of color works really well for dark skin tones. But of course, anyone can pull it off. I used three thin coats here. Meg. This is a stunning apple green metallic. Green is my favorite color so naturally, I like this polish. I smiled when I saw this was named Meg. I automatically thought of Family Guy. Lastly, we have Zuza. This is a light aqua blue packed with silver shimmer and hints of green shimmer though out. Oh mama! This is so, so pretty. Anyone else feel like they're really at the beach? I'd recommend a topcoat with Zuza though since it dries a bit matte. This is so amazing in person, its currently on my fingers! These summer collections have a little something for everyone. I much prefer Beach to the Surf Collection though. All polishes, with the exception of Shelby, had easy application. The majority of polishes are quite unique, to the point that you have to wonder where Zoya comes up with their shade ideas. But Carly feels really misplaced in the mix. My favorites were Shelby, Arizona, Wednesday from the Beach Collection and Myrta, Meg, Zuza from the Surf Collection. I love that Zoya picks unique names for a lot of their polishes. Lord knows there are enough things labeled with more popular names like Hannah or Emily, glad Zoya made room for a Kimber and Arizona. 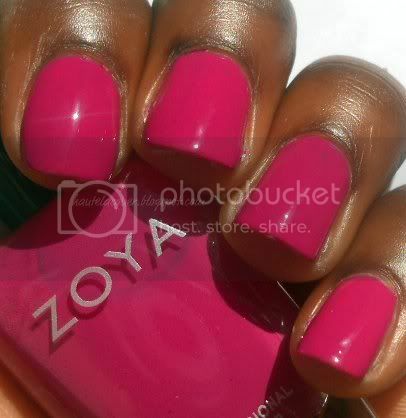 The Zoya Beach and Surf Collections are now available on zoya.com and retails at $8.00 each per bottle.